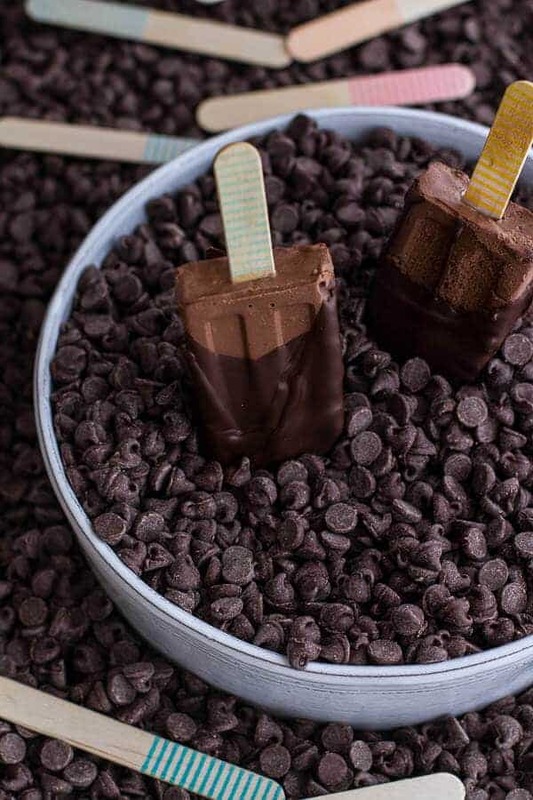 Really, these need to be called The Best Damn Chocolate Fudge Popsicles. And they only just happen to be vegan. I promise you though, these are so freaking good. Creamy, fudgey and extra chocolatey. Just the way they should be. When I was younger my mom would buy those fudge popsicles from the store that were like sixty calories and fat free. Believe it or not, I totally thought those things were awesome. I think I just liked that they were cold and had a chocolate flavor. I have not had one of those for a while, and these days I never buy any “diet” products, because um eew. I mean, whole food all they way if you ask me. Anyway, I was thinking about those pops a week or two ago. Thinking about how when I go to Florida in June those would be really awesome because Florida in June is really hot… Then I looked outside and started feeling kind of cold thinking about popsicles as I watched the snow fall. Today, well, I am currently blasting my little space heater because I am STILL cold and because it is STILL snowing AND because I made popsicles that scream from the freezer “EAT ME….even though is it snowing outside…. in the middle of MAY”. But it’s ok because in my head, where I can use my imagination, things are all warm and sunny. So it’s all good, I am happy and I have popsicles. Life is definitely good… especially on a Friday. Oh, did you catch the part where I said I am going to Florida in June? I am, I am! And I am so excited, just me and my grandma for a week of shopping, cheese and crackers, and sunshine. Cannot wait. These popsicles though? 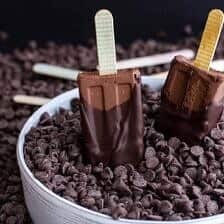 Yes, they are vegan and yes, they are the easiest things ever AND you do not even have to have popsicles molds make them. You can use paper Dixie cups and then just peel the paper away. Now, when you read the ingredients it might make you a little scared. I mean dates? Cashews? Kind of a weird mix, but I promise all you taste is chocolate, and the texture is creamy, silky and honestly incredible. I have to say, these totally shocked me. All those years of eating icy, bland fudge pops when I could have been eating these HEALTHY (YUP!) fudge pops? What a waste. Seriously, if there is one thing you do this weekend, it’s got to be to make these. You can do it. In a food processor or high powered blender combine the cashews, coconut milk, coconut oil, cocoa powder, dates and vanilla extract. Blend until smooth, thick and very creamy, about 10 minutes. Scape down the sides of the bowl 2-3 times during blending. Spray six popsicles molds with cooking spray or olive oil spray. 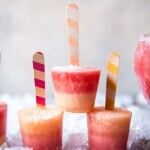 Divide the mixture among 6 popsicle molds or I highly recommend using small paper dixie cups. I used the molds the first time I made these and they were pretty hard to get out. The second time I used paper cups and just peeled the paper away. It worked much better. 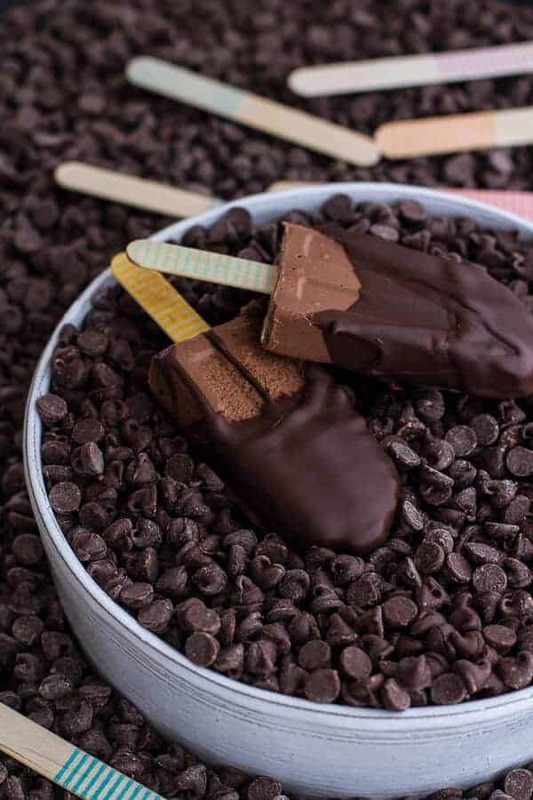 Once the popsicles are frozen make the chocolate shell. Combine chopped chocolate and coconut oil in a medium sauce pan over medium heat. 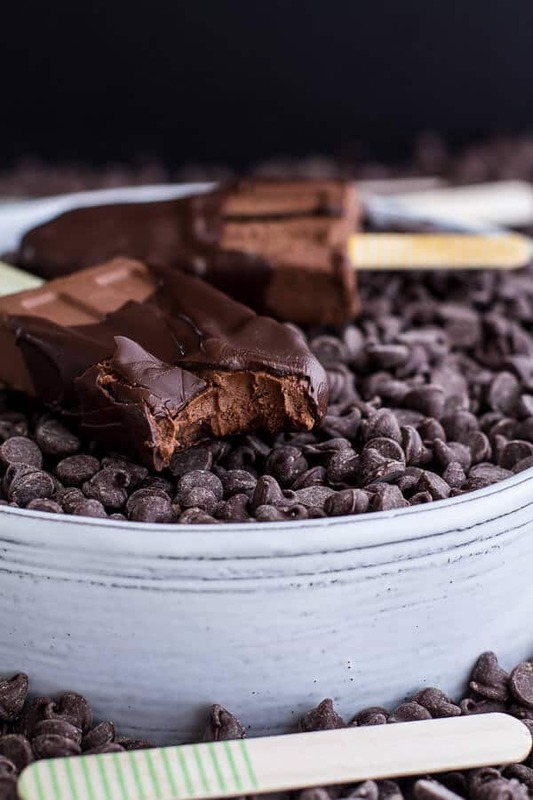 Stir frequently until chocolate is almost melted. Remove from heat and stir until completely melted and smooth. You can also do this in the microwave. Remove the popsicles from the freezer and peel away the paper cups (or remove them form the molds). 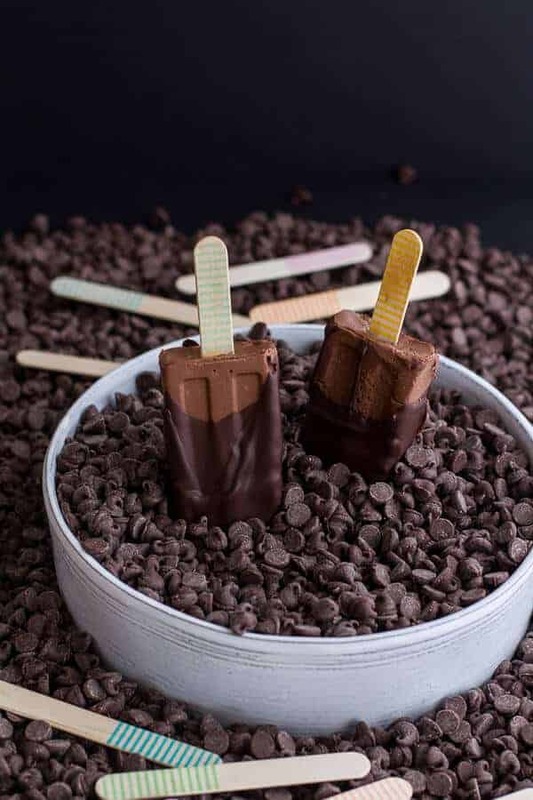 Dip each popsicle in the chocolate shell sauce and then place on a wax or parchment paper lined baking sheet. Repeat with the remaining popsicles and then place the pan in the freezer for at least 10 minutes. Keep frozen. *Inspired from Shape April 2014 Issue. Peanut Butter Swirled Chocolate Fudge Popsicles. Those popsicles indeed scream eat me! They look so delicious! 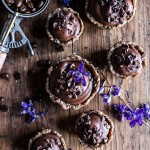 Chocolate and dates are such a good combination! I have a few vegan friends this would make such a cute and easy dessert! I’m loving this Tieghan! Chocolate without too much guilt. yeah! Anything that’s dipped in chocolate. And I don’t considerate myself a desperate person, but since I love store fudgicles, I can only imagine how much snazzier these are. These look incredible Tieghan. I will be trying these for sure! Amazing…who would have thought made from dates…I’m totally tricking my husband with these…and I love the striped popsicle sticks so cute. I lived on fudgicles in high school and these bring back all those great memories. Oh these pospicleaaaaaaaaahs! I can’t believe it’s still snowing over in Colorady…it’s been nothing but bluebirds and sunshine over here. Hand me them popsicles, it’s popsicle-ing weather round these parts! These look so creamy and fudgy! Perfect treat for the 90 degree weather coming this weekend. If I were you right now, I would be out of my mind if we still had snow in May. Crazy. But on the upside, these popsicles look freaking amazing! I love your popsicle sticks and OMG they look so creamy and silky inside. SO making these this summer! Have a great weekend, Tieghan! pinned. Trust me, I am! Thanks Sarah! Very interesting! Gotta try these babies. I am obsessed with your photos, here! Love al of the chocolate chips! And those popsicles look to-die-for! Can’t believe you’re still getting snow! I’m sending warm vibes your way from Florida! hank you so much, Rachael! Thanks Naomi! Hope you guys are having a great weekend! Done and done! It’s been SO hot here. I can’t believe it’s still snowing out there!! Thanks for taking one for the team, Tieghan. Thanks Todd!! Enjoy the warmth!! Thanks! I will so be trying that!! These are truly amazing Tieghan. I can’t wait to make these for the boys over the summer. Maybe sooner, as it is 100 here today. Have a great weekend! I could use several of these today! Yumm! gosh… i need to have it right now.. yummy! these sound great. i love healthy frozen treats! Wow! These look amazinggggg. I need these in my life immediately! So much chocolatey goodness. 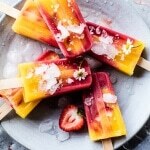 Tieghan, these popsicles look incredible! I haven’t craved a popsicle in a long, long time, but I want one of these right now. THANK YOU, Kate!! Hope you are having a great weekend! They look amazing Tieghan! Perfect summer treat. The first (and only) fudgsicle I had as a child was one of the non-fat, low-sugar variety, and it was so bad that I thought for years that I just didn’t like fudgsicles. It wasn’t until college that I realized there were better ones out there, but not until today did I realize I could even make them myself! This recipe looks great – I’ll have to try it as soon as the weather here warms up! Haha! Seriously, real fudgsicles are the best!! Um, these pops – AMAZING! These pops + crackers & cheese with grandma – DOUBLE AMAZING!! I am making these ASAP! It’s already a million degrees in Texas, so popsicles need to happen. I love that these are vegan, and without the coating, naturally sugar free! Did you have to soak the cashews? Nope, no soaking!! Thanks so much and I hope you love these!! I definitely want to try making these! Thanks! Hope you love them, Kelly! #1 – Perfect 10 for presentation. I love the sea of chocolate chips (who wouldn’t?). #2 – Anybody who keeps that many chocolate chips on hand wins. I won’t even tell you how warm it is today in CA but I’m about to go read by the pool and I need one of these incredible pops! Jealous!! Thanks so much! Hope you are having a great weekend! Vegan or not, I LOVE these. So simple! I can not wait to make them. I still have to found a nice mould. I love your blog you are really talented. Gorgeous pictures!! This looks amazing, can’t wait to try it! These are gorgeous! And I love making creamy vegan treats with cashews! Yum! Thanks you so much, Heather! Hope you guys are having a great weekend!! This seriously looks like fun! 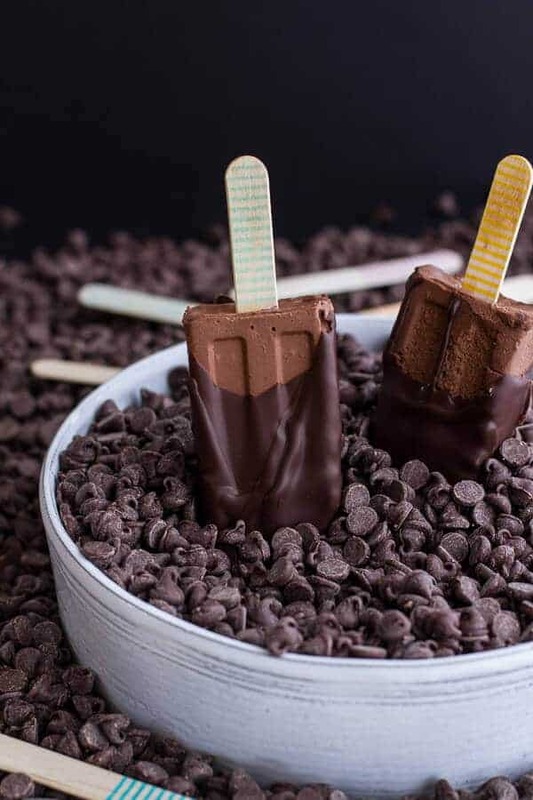 I love the popsicle decor with the chocolate chips in the background! I made these for my 2 year old who can’t have sugar. We omitted the chocolate dip for that reason, but even without they were unbelievably good! I’ve been dreaming about eating one all day! Another added bonus is that these don’t melt, which is so key for toddlers. I love your blog! I am soooo excited to make these Tieghan!! 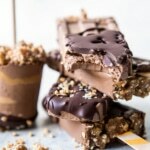 Just last week I made some chocolate covered ice cream bars using soaked cashews as a base and they are incredible. 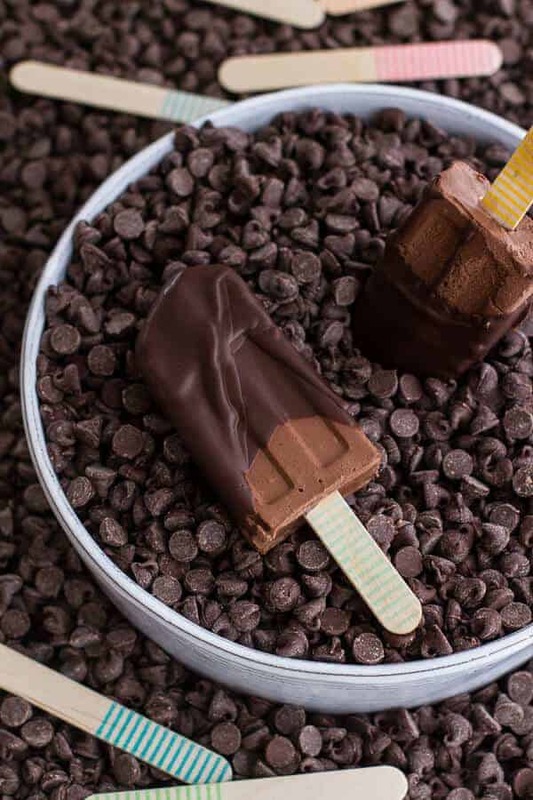 I know your fudgesicles will be a staple in my home. Made your dark chocolate avocado mousse last night…always a winner. Thanks for your hard work and beautiful photographs. Thanks Kristen!!! Hope you love these! I only have unsalted cashews on hand, would they still work? Yup! Just add a pinch of slat. Hope you love these! These look divine!! Especially the delish chocolate shell! 🙂 Pinned! Looks awesome! Will the recipe work without cashews? Or is there a substitute? My son is allergic to nuts. Thanks! Unfortunately, the nuts are a must. They are the foundation of the recipe. So sorry! Thanks Tieghan, I’ll make another one of your awesome chocolate recipes for him! I have the same issue. Could I use roasted salted soy beans instead? Hey Caryn, I do not think that would work. You need a creamy nut to get that creamy base. Can you not eat cashews? Can you eat other nuts? We have severe tree nut and peanut allergies in the family. Oh man, I am sorry. I do not think this will work with out nuts though. Sorry! I just want one right now!!! Despite the fact that I am shivering in my office and it’s winter outside right now! Oh man, enjoy your winter if you can! this is the 2nd post I’ve seen on fudgsicles in 2 days. I’m taking it as a sign. must. make. now! 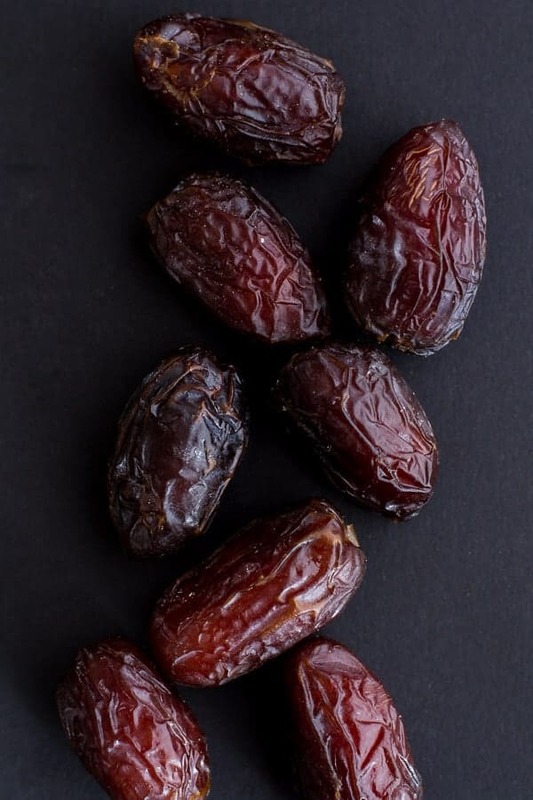 I have never tried dates, even though my husband and sons all like them. That means I have them in the pantry, so I must make these. If they go with chocolate and cashews, they must be good. Oh, I’m in southwest Florida and it was 97 degrees today. Definitely warm enough for fudgscicles. Hope you love these!!! Thanks Heather! Instead of spraying the molds with oil, try running the outside under hot water to remove them! Yes, I do that too! Thanks! Ugh. Oh no! How did you make them? I used ordinary dates instead of medjool dates (I used about 15, since they’re smaller), I used coconut milk from a carton instead of a can, and I used vanilla essence instead of vanilla extract… I’m not quite sure where I went wrong, as I followed the instructions everywhere else, it just didn’t work. These are so delicious! I just made them, and they’re really good, but FYI, the recipe is way too thick for a Zoku. I couldn’t get them out, so I’m eating them with a spoon, but I’ll try again next time with double the coconut milk. Happy you loved these. THANKS! what is a Zoku? Thanks!! I added the dates for sweetness. Wow. These are amazing! I made them late last night as kind of a spur of the moment thing, and had one this morning, and they’re unlike any fudge pop I’ve ever had. I made a half batch, since I only have four molds that are slightly bigger than average, and added two more dates since I like things a little sweeter. But I’m in love. The best part is that they’re vegan, so they fit with my lifestyle, but they’re also paleo, which fits with other members of the house. Finally, something sweet we can all enjoy! SO happy you loved them! THANK YOU! O.M.G. This over the top deliciousness! I made these yesterday and had one today. These are out of this world 😮 I’m not a vegan perse, but i do appreciate a recipe being vegan. Also, this was super easy to make. The recipe states that it should yield 6 pops, but i guess my molds were a bit smaller because i had a lot left over (put in ice cube molds). No problem though. Thank you so much for this awesome recipe and for your recipes and beautiful blog in general! Made these a few weeks ago and they were delicious!! I feel you on using the cups–I used plastic molds and they were impossible to get out–next time paper cups! I have to agree, paper cups are so much easier! I have that same issue all time! What oil could you use as a substitute? I’m reading more and more studies claiming that coconut oil isn’t as good as we think. How necessary is it in this recipe? Delish! Made them twice now, the chocolate shell really adds something! Super tasty 🙂 Thanks for the recipe! I am so glad you love these! Thank you Lieke!